The CitiSense sensors transmit their air quality readings to smart phones. 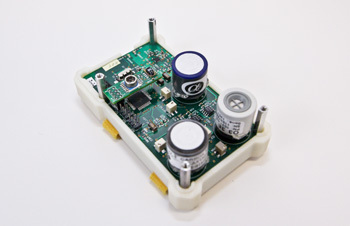 More pictures of the sensor and its smart phone interface can be found here. CitiSense is the only air-quality monitoring system capable of delivering real-time data to users’ cell phones and home computers—at any time. Data from the sensors can also be used to estimate air quality throughout the area where the devices are deployed, providing information to everyone—not just those carrying sensors. Just 100 of the sensors deployed in a fairly large area could generate a wealth of data—well beyond what a small number of EPA-mandated air-quality monitoring stations can provide. For example, San Diego County has 3.1 million residents, 4,000 square miles—and only about 10 stations. The CitiSense sensors detect ozone, nitrogen dioxide and carbon monoxide, the most common pollutants emitted by cars and trucks. 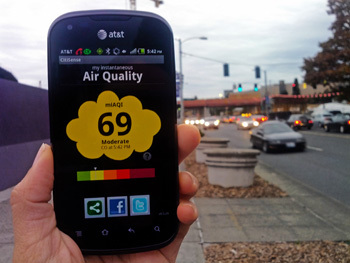 The user interface displays the sensor’s readings on a smart phone by using a color-coded scale for air quality based on the EPA’s air quality ratings, from green (good) to purple (hazardous). Researchers provided the sensors for four weeks to a total of 30 users, including commuters at UC San Diego and faculty, students and staff members in the computer science department at the Jacobs School of Engineering. Computer scientists presented findings from these field tests at the Wireless Health 2012 conference in San Diego earlier this year. A view of the inside of the CitiSense sensor: the three cylindrical components detect ozone, nitrogen dioxide and carbon monoxide. The sensors turned out to be great educational tools for their users. Many people assume that pollution diffuses equally in the air. But that’s not true. It actually remains concentrated in hot spots, along main roads, at intersections and so on. The sensors made this clear for users. Wendy Chapman, an associate professor at the UC San Diego School of Medicine, was one of them. She often bikes to work and discovered that pollution on her route varies widely. She was exposed to the most pollution when she used the bike path along State Route 56. But when she drove home on that same road, she had virtually no exposure. “The people who are doing the most to reduce emissions, by biking or taking the bus, were the people who experienced the highest levels of exposure to pollutants,” said Griswold. Users discovered that pollution varied not only based on location, but also on the time of the day. When Charles Elkan, a computer science professor at the Jacobs School, drove into work in mid-morning, the readings on his sensor were low. But when he drove back home in rush hour in the afternoon, readings were sometimes very high. Elkan said being part of the study allowed him to gauge how worried about pollution he should actually be. Air quality in San Diego is fairly good, he added. Elkan added that he could envision a day in the near future when the sensors used by CitiSense would be built into smart phones, allowing virtually everyone to keep tabs on the levels of pollution they encounter every day. Of course, as pollution becomes something people can see and measure, they might start worrying about it more. Many of the users in the study did take action to limit their most severe exposure to pollutants. For example, bicyclists found out that they could avoid a great deal of exposure by simply biking one block away from a busy street. Commuters who took the bus avoided waiting near the vehicle’s tail pipe, where the air quality was poor. One user convinced his supervisor to install new air filters in the office after registering poor air quality readings on his sensor. Researchers also noticed that the users were sharing the information they collected, not only with family, friends and colleagues but also with strangers who asked them about the sensors during their commute or in public places. In other words, the sensors turned cell phones into a conversation starter, rather than devices that isolate their users from those around them. 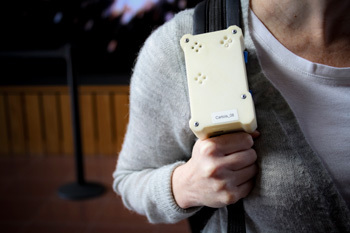 The CitiSense sensor worn on a backpack. What’s next? Some of the sensors are currently on loan to researchers at San Diego State University who are gauging air quality in San Ysidro, a community right on the border between the United States and Mexico, and one of the most polluted areas in San Diego County. Researchers hope to secure a grant from the National Institutes of Health to monitor air quality for school-age asthmatic children in that area and to determine what can be done to limit their exposure to pollutants. The ultimate goal of CitiSense is to build and deploy a wireless network in which hundreds of small environmental sensors carried by the public rely on cell phones to shuttle information to central computers where it will be analyzed, anonymized and delivered to individuals, public health agencies and the community at large. The sensors currently cost $1,000 per unit, but could easily be mass-produced at an affordable price. So far, Griswold’s team has built and deployed 20 of them in the field. CitiSense would not be possible without the expertise of computer science faculty members and graduate students at the Jacobs School of Engineering. In addition to principal investigator Griswold, the team includes School of Medicine and Calit2 professor Kevin Patrick; computer science professors Ingolf Krueger, Tajana Simunic Rosing, Hovav Shacham and Sanjoy Dasgupta; as well as graduate students and postdoctoral researchers Piero Zappi, Nima Nikzad, Elizabeth Bales, Celal Ziftci, Nichole Quick and Nakul Verma. Technical challenges remain. The data exchanges between smart phones and sensors use up a great deal of the phones’ batteries. During field tests, researchers provided users with two chargers—one for home and one for work—to ensure that their phones were not going to run out of power. To extend battery life, researchers are experimenting with uploading data from the sensors to the phones every 15 minutes or only when the user wants to retrieve the information. Computer scientists also have developed methods to turn off a phone’s GPS—a huge drain of the devices’ batteries—when the device is immobile. These innovations to extend battery life were made possible by Krueger’s previous work in service-oriented architecture, which can keep various components—like machine learning, power management and security code—much more separate than in traditional software systems, where functional elements are often so woven into the source code that it is difficult to quickly update any one aspect of the software. CitiSense is funded by a $1.5 million grant from the National Science Foundation. Qualcomm, Inc. donated funds for the cell phones used for the project.